After you have been a divorce lawyer for as long as I have, 30 years or so, you begin to see some patterns in your cases. One is the Walk Away Wife Syndrome. There will be about a million divorces this year. And the majority of them will be filed by women. Men and women handle their relationships differently. A woman monitors the relationship, and if she becomes concerned about it, she tries to fix it. To a man, this may seem like complaining. A man might react to it by withdrawing. Neither party’s needs are met. The woman may suppress her feelings, in hopes that the man will change. Finally, the wife believes she has only one choice for happiness which is separation and divorce. This is called the Walk Away Wife Syndrome. The man is often caught unaware by this, and even if he tries to change now, it is too late. In their separation agreement, Mr. Moore promised to pay his wife alimony for seven years. They both agreed that alimony would be non-modifiable by the court. But the wife remarried before the end of the seven years. Mr. Moore stopped paying support. 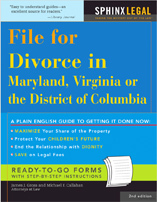 His reasoning was that Maryland law provides for termination of alimony on marriage. His wife argued that the non-modfiable clause in agreement should control. The Maryland Court of Appeals agreed with the husband. It said that if the parties wanted something different than the law in their agreement they could have said so. As for the non-modifiable provision, the court said that modification was not termination, although the two dissenting judges said that it was the most radical type of modification imaginable. Moore v. Jacobsen, 373 Md. 185, 817 A.2d 212 (2003). Many agreements do not have a cohabitation clause. In such a case, would the court terminate alimony upon cohabitation instead of remarriage? Probably not although no one has tried it yet. While there is case law that says alimony may be modified on cohabitation based on economic considerations, it is not a termination event in the Maryland statute.